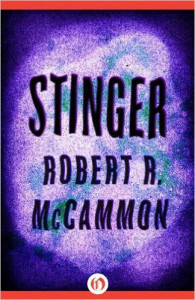 I’m not sure I would have written The Heavens Rise if I hadn’t read Stinger by Robert R. McCammon. McCammon, in my not so humble opinion, is the greatest American horror writer who’s ever lived. (Yes, he’s even better that the other guy whose last named rhymes with ring.) Stinger proves that you can craft a terrifying tale of an alien bounty hunter’s horrifying path through a hardscrabble Texas town without turning the townspeople into a bunch of two-dimensional targets in a shooting gallery and without also turning the prose into a bunch of clunky slug-lines. Fine. Maybe these questions aren’t foremost on everyone’s mind, but they were foremost on mine when I was hunting for popular horror novels from years past that included beautiful writing and well-drawn protagonists along with spectacle and scares. Nothing invites tired clichés into a speculative novel faster than the introduction of a lone, rogue alien coming to earth. But McCammon is such an assured, visual and concrete writer, he rounds out that side of the story with the same impeccable craftsmanship that defines the rest of this novel.